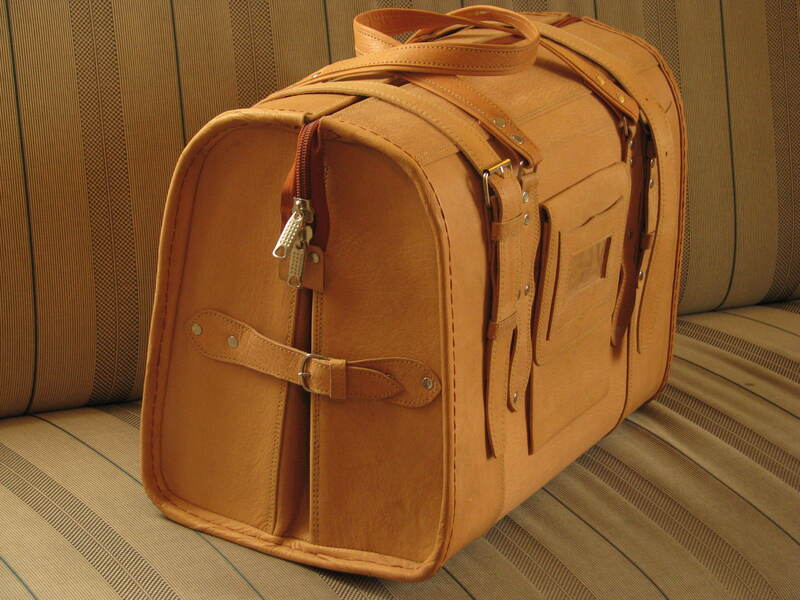 The cabin-size travel bag Marco Polo is a genuine leather travel bag. This cabin-size travel bag convinces through its classical style! This travel bag is the smaller version of the Traveller Classic. 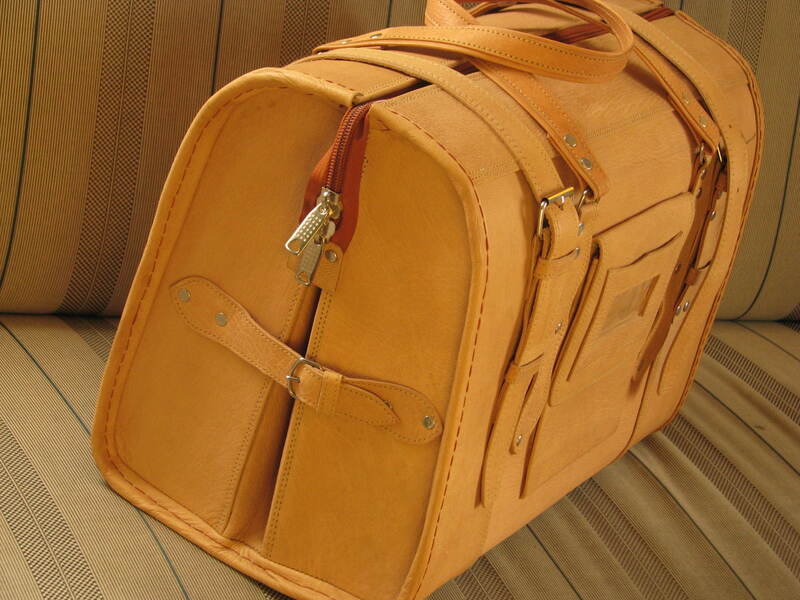 This travel bag is made from genuine goat leather. The bag closes with a zipper as well as four straps and buckles - two on top and two on the sides. 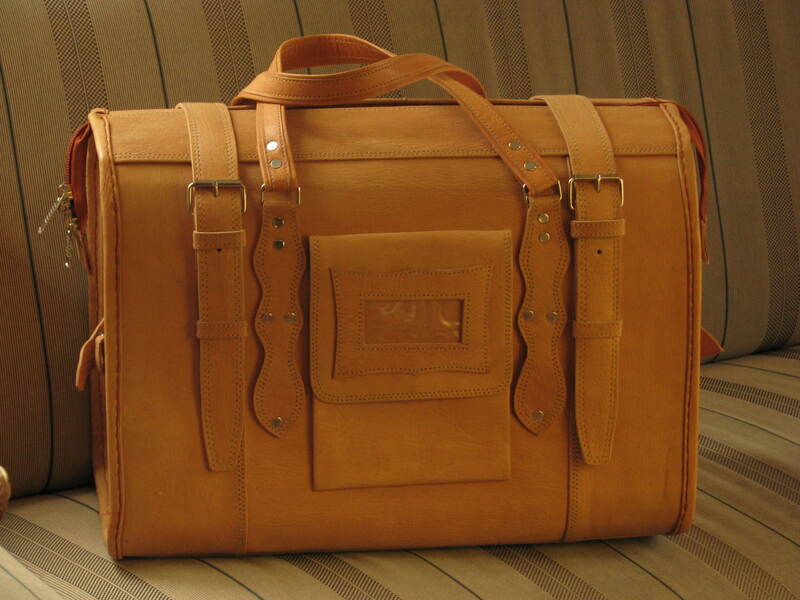 This genuine leather travel bag has two handles. As the organic leather was tanned naturally, the bag darkens nicely and becomes softer with the time which is a sign of quality. You are ready to travel! We wish you a nice trip! "Safar-i khush! ", as Dari-speakers in Afghanistan say! 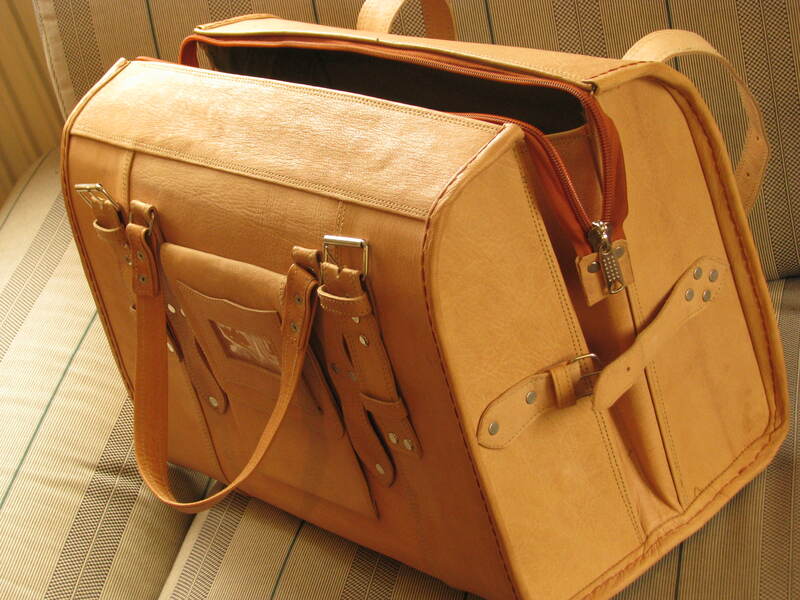 This genuine leather travel bag is handmade in Kabul, Afghanistan. The Gundara leather bags are manually produced in Kabul using old techniques, natural materials and sustainable methods of production. We mostly use natural goat (and partly colored sheep) leather for the production of our bags. 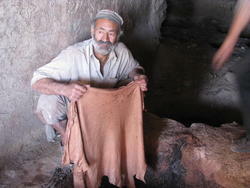 The robust goat leather is naturally tanned near Mazar-i Sharif in Northern Afghanistan. We find it important that the value creation mostly takes place in Afghanistan. The leather for most parts is produced in Northern Afghanistan and then processed in Kabul. The colored sheep leather instead is thinner and softer than the goat leather. It is imported from Pakistan. The (natural goat) leather gets sun tanned as exposed to light and with time develops into a very nice warm red-brown. When we show our clients Gundara leather bags that we have used for a long time, they often cannot imagine that these very same bags used to be pale as most of the new leather bags for sale. Through this aging process the leather also becomes softer and shinier, as it greasing naturally from inside. This process is very natural and shows that leather is not static, but somehow lives. It is a sign for the good quality of the leather. In the Gundara selection the shades of the natural-colored leather bags vary. Gundara mostly uses leather that is not pre-tanned. But some bag models, e.g. the model “Lorenzo” are produced from pre-tanned leather. Our bags combine Central and South Asian patterns with Western demands for functionality and aesthetics. Gundara bags are the kind of bags people will ask you about to know where you got them from. 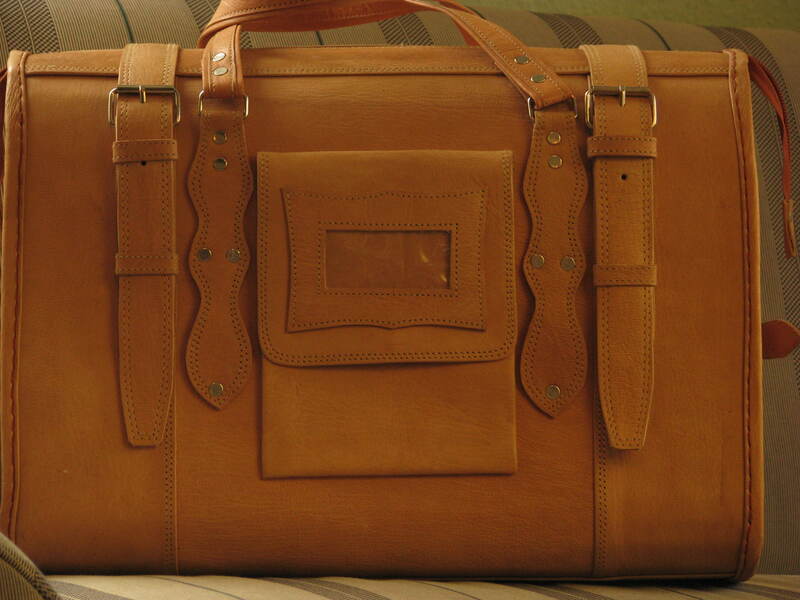 With purchasing a Gundara leather bag you support Afghan craftsmen in Kabul in a very direct way. About 30% of the purchasing price go back to the leather bag producers in Kabul. Buying Afghan means supporting the Afghan economy and giving the people a chance to get out of the vicious circle of making war or rather suffering from it. Thanks for your support! 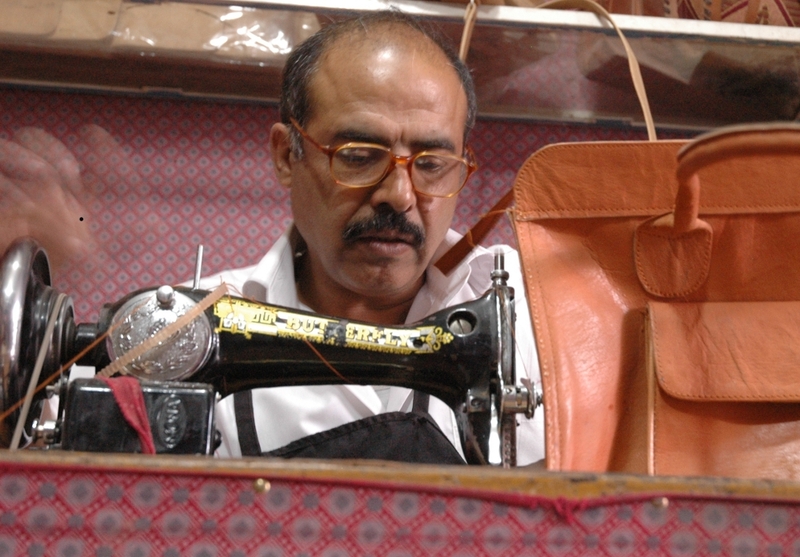 Gundara's leather bags are manually produced in a small manufacture in downtown Kabul. Mr. Yaqub is the head of this manufacture. He experienced many strokes of fate in his life. Before the Taliban took over power he had a manufacture in Kabul that was exporting leather bags to the Soviet Union. With the Taliban taking over power he escaped to Pakistan with his family. After the fall of the Taliban he returned to Kabul and reestablished a small manufacture. When we first got to know him in 2007, he had just lost his oldest daughter (out of 7 children) to an illness. In two suicide attacks targeting the Indian embassy the manufacture got partly destroyed and had to be rebuilt. Luckily, nobody in the manufacture got injured!